Archaeological remains and ancient sources help us to identify the way roman gardens were designed and the types of plants and flowers commonly grown in them. Roman gardens began as practical features. Large or small, they were sources of vegetables, herbs and fruit for the household. However by the imperial period any garden of significant size incorporated plants, water features and statues to create a careful designed haven for the garden’s owner. Archaeological remains can be interpreted using ancient source material to recreate the layout and plants most commonly found in Roman gardens. A whole range of flowers and plants were popular in Roman gardens. Herbs were essential for culinary and medicinal use. Thyme, mint, savory, celery seed, basil, bay and hyssop were some of the most popular. Favourite flowers include roses, narcissi, oleanders, violets, crocus, narcissus, lily, gladioli, iris, poppy, amaranth and wildflowers in general. The crucial factor in deciding what appeared in the garden was size. Ivy, acanthus, myrtle, box and yew usually appeared in more complex gardens, as did plane and Cyprus trees. In towns, space for plants and flowers was limited. Tenement dwellers would have to make do with a window box or plants on a roof. Only those with private dwellings had room for a garden. 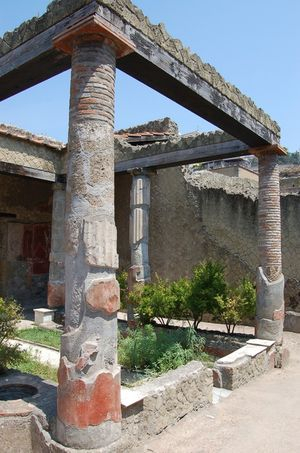 Gardens in Roman towns began as a limited feature at the very back of the house known as a hortus. An example can be found at the House of the Surgeon in Pompeii. Essentially practical rather than ornamental, they were used for growing vegetables and herbs for the household. This changed with the advent of the peristyle. The garden now became an ornamental space, for relaxation and entertaining. The peristyle garden, rendered the back hortus obsolete in fashionable townhouses. The peristyle’s origins were Hellenistic. It began as a colonnaded courtyard in the centre of Greek houses. However, the Romans innovatively transformed this feature into a garden. Peristyle gardens consisted of a series of formal flower beds, edged with small shrubs or box and surrounded by pathways. Water features and garden statues as well as small shrines would form focal points in the garden. Popular garden ornaments were statues or decorative hanging disks of gods. Priapus and Bacchus/Dionysus popular. Dionysus had a particular significance. Associated with vegetation, growth and the promise of life after death, his inclusion alluded to the garden as an earthly paradise. Many gardens would include small garden rooms or exedras used for entertaining. Often they were painted with trees, plants and birds to extend the garden theme indoors. Frescos were also used to extend the illusion of garden space in small peristyles. Painted on the walls running around the garden area, they commonly featured trees and fountains, popular garden features that the available garden space was too small to accommodate. The basic peristyle garden was expanded and embellished upon in large properties such as The Houses of Julia Felix and the Garden of Octavius Quartio. Grander yet were the gardens of country villas. With more room available, gardens could become larger and more varied. Typically, multiple types of gardens existed at large country villas: some functional, some ornamental and some recreational. Ornamental gardens were a larger version of the townhouse peristyle. Flower beds, elaborately arranged in different shapes or presented on raised terraces were contained in colonnades with hedges, trees and water features. Often, these gardens would have their own buildings separate from the rest of the house. Pliny the Younger describes a self-contained garden retreat at his country home. This finds its echo in the pergola in the garden of The House of Diomedes, situated on the edge of Pompeii. This garden illustrates the sheer scope of such large peristyle gardens. Trees, shrubs and flowers surrounded a dining area that was accompanied not only by a fountain but also a fish pond. The internal viridarium was also a common feature. Basically an indoor garden sitting room, its walls were decorated with frescos depicting plants and birds. Country villas also showcased a form of garden art much loved by the Romans: topiary. Inherited from the Greeks, it was so popular that a sub class of gardener, the topiarius developed. Pliny describes box hedges of his Tuscan villa which were trimmed to resemble shapes and animals. The gardens of very large estates also accommodated more active exercise. Pliny describes the riding grounds of his Tuscan estate. This was essentially a landscaped area with tree lined pathways where people could walk or be carried in a litter. These avenues or ambulationes were common in the grounds of large country houses and were edged with by hedges of yew and box or acanthus or trellises of vines or even trees such as Plane and Cyprus. Similarly, gardens could provide the setting for very specific exercise. The swimming pool of The Villa Poppaea was set in an area edged with trees and statues, leading onto a vast garden designed for walking. But the country garden would also stay true to its roots in the simple hortus. Each garden maintained an olera or vegetable patch. But even these practical gardens evolved. By the first century AD, they were joined by hothouses for the forcing of grapes and melons. Wilkinson, Paul, Pompeii: The Last Day .BBC books.